EVART — Manning the grill in his one-window burger joint, Jerry Collins briefly contemplated his northwestern Michigan community’s relationship with Nestlé Waters North America Inc.
Collins may be resigned, but others are energized and vowing a fight after the Michigan Department of Environmental Quality in April approved plans to allow Nestlé’s Ice Mountain water bottling brand to pump up to 400 gallons per minute — more than 210 million gallons per year — from a well just outside of Evart. The proposal generated statewide outrage, and the larger fight against Nestlé’s withdrawals may have just begun. Water lawyers are eying several avenues for challenging the DEQ permit, first at the agency and possibly in court. Such a battle would echo an early 2000s courtroom showdown, when conservationists and property owners — worried about environmental damage — successfully limited Nestlé’s pumping in nearby Mecosta County. “The DEQ’s permit is by no means the last word,” said Noah Hall, a professor of environment and water law at Wayne State University who has represented conservation groups in past challenges of Nestlé. Michigan Citizens for Water Conservation, a group that previously sued Nestlé over its withdrawals, said last week it was preparing to contest the permit. “The state of Michigan has clearly bent the law to favor Nestlé,” the group wrote in a statement, arguing the state granted the permit without “real data” about the environmental impact of the withdrawal. 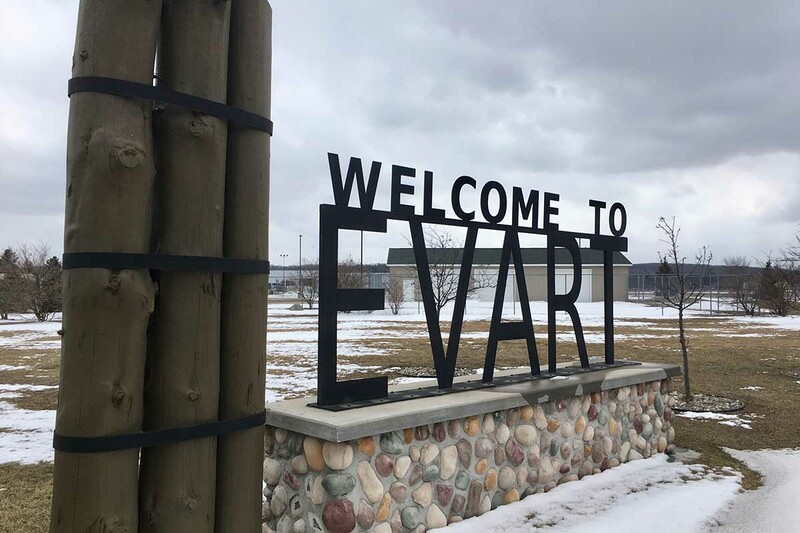 Evart, population 1,900, sits along the Muskegon River about 80 miles northeast of Grand Rapids. Besides Nestlé’s footprint, the town is known as host of the “Grand Daddy" of all dulcimer festivals — the world’s largest gathering of those who play the typically trapezoidal stringed instrument. Residents crave jobs, and maintaining city services is a challenge. Surrounding Osceola County has a poverty rate of 23 percent — eight percentage points above the state average, according to U.S. Census Bureau. At least half a dozen storefronts along Evart’s Main Street are vacant. A note on the door of City Hall last month informed visitors mold spores had forced staffers to relocate to the municipal airport. Michigan has 7,300 toxic sites. Money for cleanups is almost gone. But the area is blessed with a vital resource: high-quality groundwater. Nestlé Waters North America sees dollar signs in the water. The company churned out $4.5 billion in sales last year from 27 bottling factories for a dozen brands in the U.S. and Canada — including the Ice Mountain facility in Stanwood, about 30 miles southwest of Evart. Nestlé isn’t the only water bottler in Michigan (Plymouth-based Absopure is the biggest in-state competitor), but it’s by far the biggest water consumer among such companies. The Ice Mountain plant draws 1.1 million gallons each day from nine wells, according to the DEQ. Evart owns two of the wells, charging Nestlé the same $3.50 per-thousand gallon rate residents pay. Last year, the conglomerate paid the town $313,000 for 88 million gallons of water, according to City Manager Zackary Szakacs. Two wells are at the plant site and others are dispersed around the countryside outside of municipal water systems. They include the White Pine Springs hole in Osceola Township, where Nestlé has bought hundreds of acres of land. That’s where Ice Mountain in 2016 sought to boost pumping from 250 to 400 gallons per minute, triggering the latest controversy. The proposal drew a record 81,020 public comments to the DEQ, only 75 of which were in favor. Several locals told Bridge Magazine they were uncomfortable — if not outraged — by the decision, though a few who opposed it suggested the community would feel differently had Nestlé built its factory here rather than miles away. “We value our positive relationships with residents and community leaders, ”the company told Bridge. That includes Szakacs, Evart’s city manager. Bristling at the negativity, he argues the city benefits plenty. A handful of Evart residents commute to work at Ice Mountain, he said. (Nestlé says more than 50 live “in the Evart area.”) More crucially, he said the company’s water contract has kept the city from hiking rates even higher after another huge user, auto parts supplier Ventra, dramatically reduced its consumption. Michigan is more freshwater-rich than any other state. Still, the resources are finite. Voluminous withdrawals in some — but not all — areas can strain local supplies and damage ecosystems, according to a 2006 legislatively mandated study. A small stream with any amount of groundwater feeding it “can be adversely impacted by a single high-capacity well,” the study says. That’s why the DEQ regulates major groundwater withdrawals, while environmentalists and citizens groups apply their own scrutiny. Science alone is supposed to drive decision making. Statewide, water bottlers guzzle less than 1 percent of total consumptive water use, according to the DEQ. Nestlé is the Michigan’s 85th biggest water user, excluding public water and energy providers. Some 90 percent of large water withdrawal requests came from the agriculture sector, according to DEQ data analyzed by Trout Unlimited, which advocates for anglers. But that has little bearing on whether Nestlé’s pumping from one township would harm local ecosystems, the 2006 state study suggests. And springs — where Nestlé is legally required to pump its water if it’s to use the “spring water” label — are often some of the most “fragile and vulnerable water resources,” according to Hall, the Wayne State University professor. Though Nestlé hasn’t yet fully increased its pumping in Osceola County, Maryann Borden, who lives close to the well, is among those who believe the company’s actions have already shrunk local streams. “This is what I panicked about,” she said on a snowy April day as she descended a short hill behind her home, peeled back a tree branch and pointed at the trickling waters of Twin Creek. For decades, the retired truck driver said she could stand on her deck and hear the creek “babble along” — the sound of a mini waterfall splashing onto rocks. Not anymore. The creek, which Borden figures is now half the size it was just a few years ago now gently edges islands it once flowed over. Nestlé denies that it’s to blame. Nestlé’s critics call that argument far-fetched. They point to a landmark legal case in which Michigan landowners argued — with some success — that Nestlé’s plan to pump 400 gallons per minute in Mecosta County, just south of here, would wreak hydrological havoc. Michigan Citizens for Water Conservation sued after DEQ permitted pumping from Mecosta wells in 2001 and 2002. Following a 19-day trial that featured thousands of pages of documents and scientific analysis, a Circuit Court judge ordered Nestlé to halt its pumping. In 2005, the Michigan Court of Appeals reversed some of the lower court’s findings but held that Nestlé’s proposed pumping rate was “unreasonable.” The parties would later settle on a pumping rate of 218 gallons per minute. Jim Olson, a Traverse City environmental attorney with For Love of Water, a nonprofit advocacy group, was among those challenging Nestlé in the Mecosta case and his firm is representing the conservation group this time around. He said pumping from Osceola Township would likely cause harm, particularly because headwaters in the area — small tributaries flowing into larger rivers or lakes — tend to behave similarly. Olson said Nestlé’s opponents may also try to poke holes in the way DEQ handled the permit application — such as requiring the company to submit a water monitoring plan after securing the permit, instead of before. Last week, Michigan Citizens for Water Conservation noted the state gave Nestlé a permit the same month it stopped providing bottled water to residents of Flint, and Detroit was preparing to shut off water to thousands residents for nonpayment. DEQ spokeswoman Tiffany Brown defended her agency’s decision. “We take great care to assure that the process and outcome conform to the requirements of the law,” she said. The citizens group will first challenge the decision through a contested case overseen by an administrative law judge. Meanwhile, Osceola Township is trying to thwart Nestlé’s expansion plans through a zoning action that the company has thus far successfully challenged in court. Unlike Evart, township officials don’t run a municipal water system and say they don’t benefit. “In another five to 10 years, maybe not even that long, the footprint of this township and the surrounding communities are going to change,” said Tim Ladd, the township supervisor. Last year, the township denied Nestlé’s zoning request to build a 12-foot by 22-foot booster pump house, a crucial building needed to move extra water from to the Stanwood plant. Nestlé sued, and in December, Mason County Circuit Judge Susan Sniegowski sided with the company, ordering officials to issue a permit. The township is appealing, funding its legal fees through tens of thousands of dollars in donations from across the country. Nestlé contends it has met the conditions and says its presence benefits the township, even if it doesn’t pay for the water. “In Osceola Township, Nestlé Waters pays the costs to build and maintain the infrastructure, energy and taxes, like all other Osceola Township businesses who do not rely on the neighboring Evart municipal supply, Nestlé told Bridge. This situation will be repeated thousands of times over the next few generations as water becomes the worlds most critical resource and Michigan remains the center source of freshwater on earth. Nestle's CEO famously Said that water is a commodity, like any other. Here in Michigan, if you can't pay your water bill, they shut off your water, while Nestles pumps 400 gallons per minute and steals out water! If it is a commodity, it belongs to the citizens of Michigan and our legislators are allowing this precious resource to be stolen. You can't measure such a small amount, unless you're not trying to deal in facts but rather are advancing self destructive political causes. Read Dan Egan’s The Death and Life of the Great Lakes and really understand how precious our water systems are. Why are the water extractors not paying the equivalent of rights, similar to the gas and oil rights systems? Heard a GREAT idea ... since the state of Michigan isn't going to do anything about nestle's, the TOWNSHIP BOARD SHOULD!!! There should be a fee of 25 cents per 16 ounces taken, with the $$ going to the local townships for THEIR use. If the township board says no to this idea, then they should be RECALLED and REPLACED with those who should. A matter not addressed in this article is whether Nestle's bottled water products produced in Evart, MI contain any PFAS compounds. PFAS compound results are reported for in two forms, one for PFOA/PFOS and the other for Total Tested PFAS compounds (there are thousands of PFAS compounds other than PFOA/PFOS). Most of the results are "non-detect" (ND), but 1 sample shows 2 ppt of PFOA/PFOS and 2 ppt for Total Tested PFAS compounds. The other two samples show ND for PFOA/PFOS, but show 4 ppt and 20 ppt for Total Tested PFAS. There is not enough information to know if Nestle receives any of the water from Evart wells which have detected PFAS compounds since all but one of the tests are treated water and not attributable to one of the seven specific Evart wells, and there is no indication of whether Nestle has tested their bottled water from PFAS compounds. Please discard this and my prior comment about PFAS and Evart, MI PFAS testing.